"We continued to execute our long-term strategy in Q4, and realized a 6 percent increase in our enterprise solutions and services business," said Brian Gladden, Dell CFO. "We also continued to generate strong cash flow from operations of $1.4 billion in the quarter. Our strong balance sheet and cash position enabled the company to invest almost $5 billion in new capabilities and intellectual property this fiscal year, including great assets like Quest, SonicWall, Wyse and AppAssure." -Revenue in the quarter was $14.3 billion, an 11 percent decrease from the previous year, and a 4 percent increase sequentially. Revenue for the 2013 fiscal year was $56.9 billion, an 8 percent decrease. Dell's fiscal year 2012 had an extra week, which was incorporated into the company's Q4 results. -GAAP operating income for the quarter was $698 million, or 4.9 percent of revenue. Non-GAAP operating income was $954 million, or 6.7 percent of revenue. Gross margins for the quarter benefitted by approximately $250 million, primarily resulting from vendor settlements. For the fiscal year, GAAP operating income was $3 billion and non-GAAP operating income was $4 billion. -GAAP earnings per share in the quarter was 30 cents, down 30 percent from the previous year; non-GAAP EPS was 40 cents, down 22 percent. For the fiscal year, GAAP EPS was $1.35, down 28 percent year over year and non-GAAP EPS was $1.72, down 19 percent. -Cash flow from operations in the quarter was $1.4 billion, and Dell ended Q4 with $15.3 billion in cash and investments. Full-year cash flow from operations was $3.3 billion. -Dell server revenue increased 5 percent driven by strong growth in the company's hyper-scale data center solutions business and migration to the company's 12th-generation servers. The 12G-server line now represents almost 80 percent of Dell PowerEdge server revenue at average selling prices and margins that are a premium over previous-generation servers. -Dell networking continued to deliver strong growth, with a 42 percent revenue increase, including more than 100 percent growth in the company's Force10 business. -Dell Quest software delivered revenue over the company's stated target of $180-$200 million for the quarter. The company's security software business also grew sequentially. -Dell desktop and mobility revenue declined 20 percent and was up 3 percent sequentially. -Large Enterprise had revenue of $4.7 billion in the quarter, a 7 percent decrease. Operating income for the quarter was $393 million, a 16 percent decrease. Server and networking revenue increased 25 percent and ES&S business grew 10 percent. Revenue for the full year was $17.8 billion, down 5 percent from the previous year. -Public revenue was $3.5 billion, a 9 percent decrease. O perating income for the quarter was $236 million, a 25 percent decrease. Servers and networking revenue grew 11 percent. Revenue for the full year was $14.8 billion, down 8 percent from the previous year. -Small and Medium Business revenue was $3.4 billion, a 5 percent decrease. O perating income for the quarter was $385 million, a 4 percent decrease. SMB enterprise solutions and services sales increased 9 percent for the quarter, driven by servers and networking growth of 13 percent and services revenue growth of 17 percent. Revenue for the full year was $13.4 billion, down 1 percent from the previous year. -Consumer revenue was $2.8 billion, a 24 percent decline for the quarter. Operating income was $8 million, an 87 percent decrease. Revenue for the full year was $10.9 billion, down 20 percent from the previous year. -EMEA revenue decreased 14 percent in the quarter, Americas was down 10 percent, and Asia-Pacific and Japan declined 9 percent. Given the company's announcement Feb. 5 of a definitive merger agreement to take Dell private, the company is not providing an outlook for its fiscal 2014 or Q1. Dell Inc. (NASDAQ: DELL) listens to customers and delivers worldwide innovative technology, business solutions and services they trust and value. 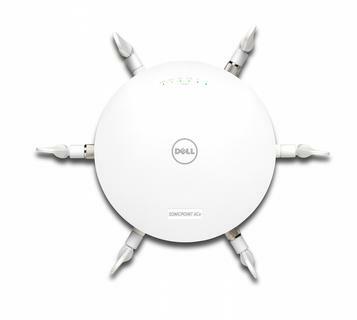 For more information, visit www.dell.com. T he fourth-quarter a nalyst call with Brian Gladden, CFO, and Tom Sweet, Corporate Controller, will be webcast live today at 4 p.m. CST and archived at www.dell.com/investor. 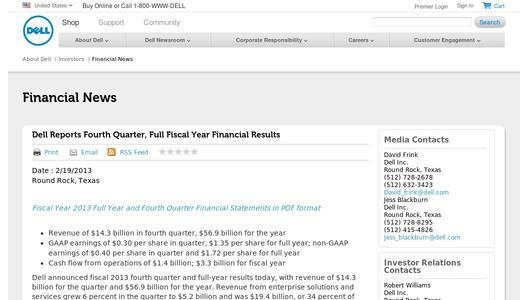 To monitor highlighted facts from the analyst call, follow on the Dell Investor Relations Twitter account at: http://twitter.com/dellshares or hashtag #DellEarnings. To communicate directly with Dell, go to www.dell.com/dellshares.